Recently, considerable interest has been focused on lignocellulosic biomass as a substrate for high value chemicals and fuels. Lignocellulosic biomass is economically appealing because it is highly renewable and globally available; however, its nano-scale structure is physiochemically robust and recalitrant to enzymes. Lignocellulose is a composite of crystalline cellulose, hemicellulose and lignin, as it found in the cell wall of many cash crops, grasses and agriculture residues. The complex arrangement and formation of this matrix still remains to be discovered. 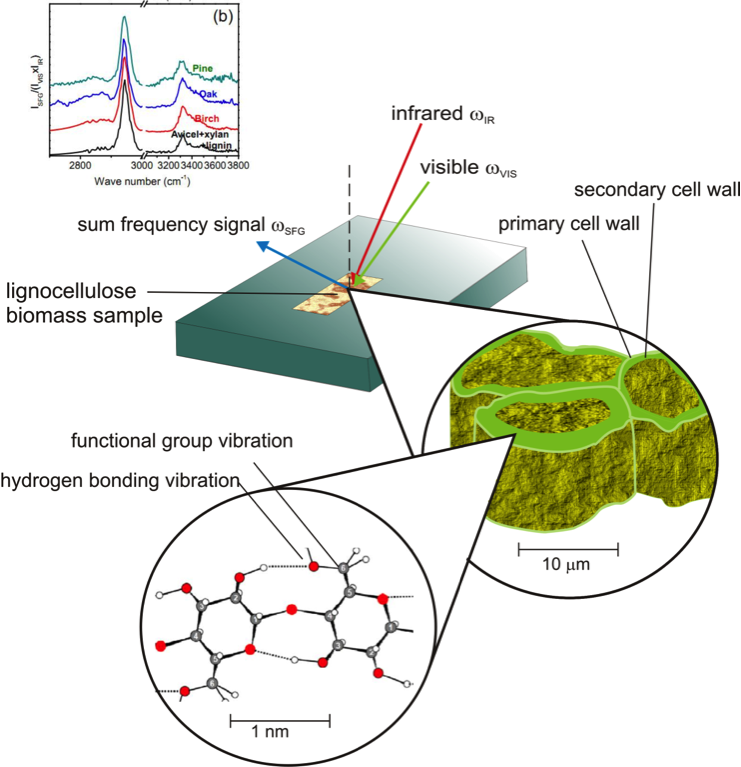 Our research has shown that for the first time it is possible to selectively detect crystalline cellulose in plant cell walls and lignocellulosic biomass using sum-frequency-generation vibrational spectroscopy (SFG). Non-centrosymmetric ordering of glucosyl residues in crystalline cellulose gives rise to a unique SFG profile. In contrast, amorphous hemicellulose and lignin do not contribute a signal in SFG. This is a main advantage of SFG over currently used analytical techniques such as solid state-NMR, XRD, FT-IR and Raman spectroscopy; thus, SFG provides a unique opportunity to study many of the unanswered biological questions surrounding lignocellulose. Current SFG study of cellulose focuses on two questions. The first is identification and quantification of crystalline cellulose found in green-algae (Valonia, Cladophora), bacteria (Acetobacter Xylinus), and angiosperms (Arabidopsis, cotton, wood, etc). The second is to understand cellulose and hemicellulose interactions and their effects on cellulose crystallinity and macro-scale properties of plant cell walls. Beyond these two areas, future plans are underway to study structures of other biopolymers (amylose, chitin, etc) and enzymatic hydrolysis of biomass for biofuels. This project is part of a newly organized collaborative, The Center for Lignocellulose Structure and Formation (CLSF) at Pennsylvania State and is an Energy Research Frontier Center funded by the Department of Energy. Collaborators include Daniel Cosgrove (PSU, Plant Biology), Jeffery Catchmark (PSU, Ag&Bio Engineering), Candace Haigler (NCSU, Crop Science) and many others. For more information please visit www.lignocellulose.org. Schematic connecting the principles of sum-frequency-generation (SFG) and its application to intact lignocellulose biomass samples: birch, pine and oak. 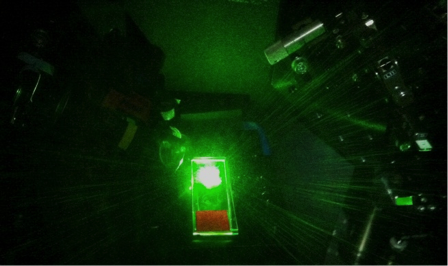 Experiment on cotton fiber using SFG 27ps Nd:YAG laser (EKSPLA).